BREAKING NEWS: the Tissue Box Spy Camera is now offered at an amazing price. Finally you can become one of the exclusive few to own this awesome spy gadget! 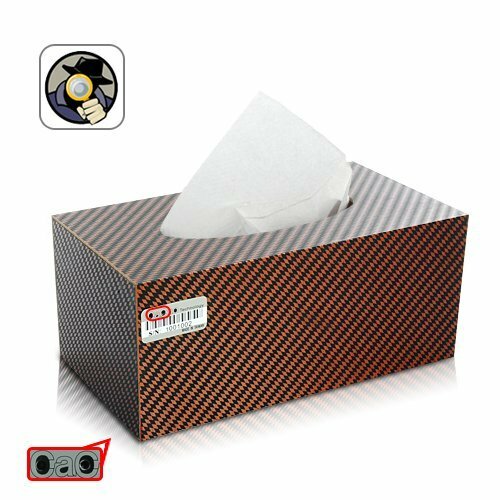 Recording at 30 FPS frame rate and high definition 1280 x 960 resolution, the Tissue Box Spy Camera clearly and covertly captures every movement you want. Thanks to its 4GB internal memory, you don’t have to worry about running out of storage in the middle of a “mission”. Just press one button and it will continuously record for up to 10 hours! You Will Have So Much Fun Your roommate Joe was giving himself a pep talk before going out on a date with his dream girl; Jack was crying after breaking up with his girlfriend. They all did this in front of the bathroom mirror, talking to themselves. What they did not know was: your Tissue Box Spy Camera was secretly recording everything they did and said! Just imagine their reaction when you send them the video! April Fools’ Day prank of the year! Cool and Practical If you are worried about your supplier not keeping their words, or a traffic police officer treating you abusively, this spy camera can help you by videotaping the evidence you need to protect yourself.